Slovenians have always been a nation of beekeepers. We are the only European Union member state, which has protected its own autochthonous honey bee, which means that it is prohibited to breed other races of honey bees. The main task of honey bees is to pollinate plants, with which they enable the existence of life on our planet and in turn nature rewards honey bees with nectar from which they produce honey. Since honey bees bring more than they consume, a beekeeper takes away the surplus in honey and uses it for their own sustenance. Honey is an excellent source of nutrition, restoration and sedation. It is a well known fact that it has a beneficial influence on our health as it works against inflammation and microbes and helps us to relieve our daily troubles. It is also very useful in cuisine as it gives dishes a special aroma. Slovenian beekeepers produce good quality and safe honey. Internal control is performed during processing and our beekeeping is performed in accordance with the guidelines in good hygiene practices in beekeeping, which are based on the principles of the HACCP system. Besides this Slovenian beekeepers offer a wide variety of bee products. We are pleased that you have visited our website, a tool with which you will be able to become informed about the features of Slovenian honey and its usefulness for human health from the comfort of your home. 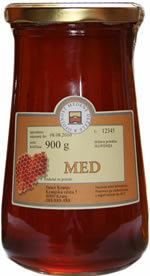 You will also find useful information about everything offered regarding Slovenian honey. Visit Slovenian beekeepers and convince yourselves about their offer. When you try different types of honey, you will probably end up taking home a completely different type of honey then the type you initially had in mind. Each one is a world of smallness in its own right. Why enjoy honey products made by Slovenian beekeepers? • Because they are of good quality and are safe. • Because pollination is important for preserving the variety of our natural vegetation. QUALITY In order for honey products to help us invigorate and preserve our health they must be of good quality and safe. The expiry date for honey can be long lasting if it is stored in the appropriate conditions. If honey is stored in a warm location it loses its valuable features a lot faster. The long distances that honey travels when being traded around the world and stored in different warehouses represents a danger that its quality may be reduced. Honey and the rest of the honeybee products made by Slovenian beekeepers practically come directly from the beehive into our hands, which is why the quality of the honey is preserved. A beekeeper cannot improve the quality of the honey. The honey that the bees produce is of the highest quality and the beekeeper merely preserves this quality. DOMESTIC ENVIRONMENT When we eat honey and any of the other honeybee products it is important that we consume food from the environment in which we live in, since we do not intake substances that are foreign to our organisms. If we consume substances from a foreign environment there is a greater chance that an allergy may appear. TRACEABILITY Besides this, Slovenian beekeepers ensure traceability. In addition to the exact origin of the honey the complete address of the beekeeper is also printed on the label, contrary to some honey, which only states that the honey is a mixture of honey from EU member states and Non-EU member states. As a result, we do not even know exactly which state the honey originates from. POLLINATION In the end, the value of the honey and the rest of honeybee products is a lot smaller than the benefits of honeybees, which they offer us by pollinating. As the main pollinators we can thank honey bees for a rich selection of fruits and vegetables in our diets, as well as the variety found in the natural environment. The next time you buy honey, buy it from a Slovenian beekeeper because by doing so not only are you going to buy health but also pollination whereby you will also actively take care of the environment, which you live in.